This article is about the fire-throwing Hammer Bros.. For the Bros. Attack from Mario & Luigi: Superstar Saga, see Fire Bros. (move). For the challenge from New Super Mario Bros. U, see Fire, Bro!. The Fire Bro (or Fire Brother) used to be a rare variety of Hammer Bro, but are now more commonly employed in levels more than any of the Hammer Bro family, making it a semi-common enemy in the present. Instead of throwing Hammers like their relatives, Fire Bros. have the unique ability to throw (originally spit) Fireballs. These fireballs move very fast, as fast as Fire Mario's own fireballs. Ice Bros. can be considered their polar opposites, as an Ice Flower is the polar opposite of a Fire Flower. Fire Bro sprites, from Super Mario Bros. 3. Fire Bros. first appear in Super Mario Bros. 3 as rare enemies. In fact, only three appear in the entire game. Two appear in the Desert Land, after breaking a boulder in the desert with a hammer. Once they are defeated, Mario or Luigi obtains a Magic Whistle. Whether defeated or not, it is mentioned by Princess Peach's letter as an unidentified thief of the whistle that escaped to the east of the desert. One also appears in the first Hand Trap level of Dark Land. On the map, their map icon was a Hammer Bro in the original NES version. In the SNES remake for Super Mario All-Stars, their map icon was adjusted to resemble an actual Fire Bro from the game. This adjustment remained intact for Super Mario Advance 4: Super Mario Bros. 3; in that version, Fire Bros. also appear in a few World-e levels: Bowser's Last Stand, Koopaling Confusion, and Bowser's Airship 2. The pair of Fire Bros. in New Super Mario Bros.
Fire Bros. reappear in New Super Mario Bros. as very rare enemies. Only a single pair is found in World 8-7, right after the checkpoint. They still use the same attacks they had in Super Mario Bros. 3. In this game, Fire Bros. throw their fireballs, just like Fire Mario, rather than spitting them, and the sound effect is the same as Fire Mario's. Fire Bros. reappear in New Super Mario Bros. Wii, having the same attacks from New Super Mario Bros. Like in that game, these Fire Bros. throw their fireballs instead of spitting them out of their mouths. From being rare in the past games, they are semi-common in this game. They are more common than the Hammer Bros., the latter being common in the past games; they may also appear as 'guardians' at the end of their levels. A single Fire Bro is near the end of World 2-3. 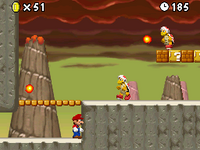 Three Fire Bros. are found in World 3-4: one at the start, another near halfway of the stage, and a third near the end. In World 6-6, the same number of Fire Bros. guard both the normal and alternate exits. In their last appearance in World 9-7, they appear as a duo on platforms near the end of the level. They are mostly teamed up with Fire Piranha Plants. Fire Bros. also appear in New Super Mario Bros. 2. They are found in World 6-3 and behave the same way they did in the previous New Super Mario Bros. games. Fire Bros. can also be turned gold when Mario touches a Gold Ring. Golden Fire Bros. toss three coins as opposed to fireballs while the effects of the ring last. A single Fire Bro appears in the second course of the DLC stage Coin Challenge Pack B. When they throw fireballs, they sound like Gold Mario's fireballs. Fire Bros. reappear in the Wii U game, New Super Mario Bros. U. They behave the same way they did in the past installments, and are more commonly employed than any of their other brethren. Additionally, Fire Bros. have their own Enemy Course in Layer Cake Desert in which either a lone Fire Bro or a trio of Fire Bros. guard a star, as well as making their first appearance as a fortress/castle enemy. Two of them are also found in the Challenge Mode, Fire, Bro!, in which the player must dodge their fireballs within fifteen seconds. They area also featured in the challenge, Seriously! Fire, Bro!, which has the same objective, but with four Fire Bros. They also appear in Snaking above Mist Valley, Slide Lift Tower and Ludwig's Clockwork Castle. This game also shows the first case of Fire Bros. being flipped, as proved in the level Fire Snake Cavern if the player stuns it with the light of a Glowing Baby Yoshi. In Light Blocks, Dark Tower, Fire Bros. can ignite Bob-ombs with their fireballs. This made it a dangerous guardian of one of the Star Coins in the level, as Bob-ombs repeatedly drop from a pipe in the cave ceiling, increasing the probability of the Fire Bros. blowing them up. One way to prevent any danger due to their fireballs is to simply neutralize it with an iceball. Fire Bros. appear in Super Mario 3D World, making their first appearance in a 3D Mario platformer game. These enemies are extremely common in this game, appearing in a multitude of levels. Their attack pattern is the same as that of Hammer Bros. and Boomerang Bros. in 3D Mario games, tossing two fireballs directly at Mario before jumping to another position. Their fireballs can travel through Clear Pipes, and can also be put out. Some of them are found atop Goomba Towers and function as their commanders whose defeat clears remaining Goombas on a stack as well. Also, Fire Bros. appear in four different hideouts throughout the game that act as optional enemy battles. In the game, Fire Bros' fireballs can defeat other enemies that come in contact with it, even each another. This is a great strategy in Fire Bro enemy blockades, in which Mario can get the Fire Bros. to face each other or get behind one another, and thus defeat each other due to their own crossfire. Fire Bros. appear as enemies in Super Mario Odyssey, where they are found in the Luncheon Kingdom, where they wear chef hats, and the Wooded Kingdom. Mario must knock their helmets off before he can take control of them using Cappy. When Mario takes control of a Fire Bro, he is able to jump higher and throw fireballs. Removing helmets from Fire Bros. reveal that they have four clumps of fiery colored hair on their heads. Fire Bros. appear as enemies that can be placed in Super Mario Maker 2 stages. Mario the forest ranger is on the lookout for fire bugs. He has just spotted Fire Brother who is setting a fire in the forest. Fire Brother is going to be in big trouble because damaging forest land is a serious crime. 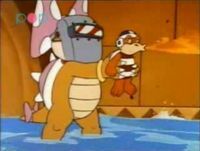 Kootie Pie using a small Fire Brother as a welding torch, from the The Adventures of Super Mario Bros. 3 episode, "The Venice Menace"
Fire Bros. make two appearances in The Adventures of Super Mario Bros. 3, where they retain their status as soldiers in Bowser's army. Like in the game, only three individuals appear. In the episode "Reptiles in the Rose Garden", two Fire Bros. and two Boomerang Bros. are ordered to guard Mario, Luigi, Princess Toadstool and Toad while they are held captive in Castle Koopa's dungeon. In "The Venice Menace", Kootie Pie Koopa briefly uses a miniature Fire Bro as a welding torch, which shoots a stream of fire rather than their usual fireballs and has Bowser stuck to the door. In Koopa Capers, six Fire Brothers appear in the first chamber of Wendy O. Koopa's secret hideout in the Magma Pits, attacking Luigi by spitting fireballs from the top of a ramp. If he is Fire Luigi, Luigi defeats five of the Fire Brothers and chases the final one into a smaller chamber, where the two get into a stand-off, their fireballs always colliding in mid-air. If he angles it correctly, Luigi defeats the Fire Brother by shooting a fireball at a wall, which it ricochets off of, right into the Fire Brother. Fire Bro is made playable for the first time in Mario Superstar Baseball, as a color swap for Hammer Bro. He is one of the unlockable characters in the games. The Fire Bro also appears on Bowser's team in challenge mode. He has slightly less speed than his counterparts, and uses an everyday bat rather than the usual hammer or boomerang of the Hammer Bro and Boomerang Bro characters. Starting with this game, the Fire Bro's appearance has been developed to be wearing a red helmet and a red shell. Oddly, even though the Fire Bro uses a bat, his batting range remains the same as that of the Hammer Bro and Boomerang Bro. The Fire Bro later appears in Mario Super Sluggers with the same bat as in Mario Superstar Baseball. His fielding abilities have improved, and he has the best batting abilities among his counterparts. However, his pitching skills are not very good; the worst when compared to the Hammer Bro and Boomerang Bro. Flare, a Fire Bro, is a fighter in the Glitz Pit alongside Bamma and Hamma Jamma. He is the only Fire Bro to appear in Paper Mario: The Thousand-Year Door. Like Fire Bros. in earlier appearances, he spits fireballs as a main attack. These fireballs not only damage opponents, but may also cause them to catch fire as well. Fire Bros. make an appearance in the third installment of the Paper Mario series, Super Paper Mario. They are encountered on the stairs in Castle Bleck and also in the Flipside Pit of 100 Trials, and act just as they did in Super Mario Bros. 3. Some Fire Bros. also have the ability to flip between dimensions. Fire Bros. make an appearance in Paper Mario: Sticker Star. They are encountered in Rugged Road, Rumble Volcano and Bowser Jr.'s Flotilla. They have a bigger rarity than in New Super Mario Bros. U, and Ice Bros. appear to be semi-common enemies. Fire Bros. retain their red shells and helmets from prior Paper Mario games, but do not have arm bands anymore, and the seams within their shells are white instead of yellow. Their only attack is to throw a fireball at Mario. They are immune to all fire-based stickers (i.e. Fire Flower and Burnhammer stickers), but take double damage from ice-based stickers (i.e. Ice Flower or Chillhammer stickers), their main weakness. When a Thing sticker is used in the first area of Rugged Road, the Fire Bros. turn into Ice Bros. Fire Bros. are mostly assisted by Shiny Paratroopas. Touching a Fire Bro's fireball outside battle causes Mario to lose 3 HP. Fire Bros. return in Paper Mario: Color Splash keeping their appearance and behavior from the previous game. They can be found in Fortune Island, Redpepper Volcano, Redpepper Crater and Black Bowser's Castle. A group of Fire Bros. in Redpepper Volcano are commanded by a blue Snifit. After they are defeated, another Snifit can be found training a Fire Bro to throw fireballs at the beginning of the level. Fire Bro makes his Mario Party debut in Mario Party 9, appearing as a co-host of the Battle minigames. Whenever a player lands on a Battle Space, either Fire Bro or Hammer Bro show up, although Fire Bro appears less frequently. When Fire Bro does show up, he makes the players play a Free-for-All minigame, of either the captain or the player in last place's choice. Afterwards, he takes ten Mini Stars from the player who finished in last place and distributes them amongst the other players based upon their ranks. If the loser does not have ten Mini Stars, Fire Bro provides the rest. Additionally, if everybody ends up in first place or last place, Fire Bro does not give or take any Mini Stars from any players. Fire Bros. make their debut in the Mario & Luigi series in Mario & Luigi: Dream Team in Neo Bowser Castle. In the field, they throw fireballs upon sight at Mario and Luigi. Making contact with any of them initiates the battle with the brother who threw them. They disappear when they eventually touch the ground. In battle, Fire Bros. can rapidly hurl fireballs with the occasional 5 Gold Coin at the Bros, who must jump to avoid the fireballs. They may also throw a large fireball into the sky for it to rain down on the targeted Bro on the next attack turn of the thrower or at the end of the battle. If the Fire Bro hurls it up with his right arm, it'll fall on Mario, who must smack it back to sender with his hammer. If with his left arm, it'll fall on Luigi, who must instead smack it back. If any of these Fireballs touch Mario and Luigi, it may give them the Char status effect. Fire Bros reappear in Mario & Luigi: Paper Jam as enemies along with their paper counterparts. They are first found during the trio's second visit to Twinsy Tropics Dungeon. After Crinkle Goomba gives the Red Medallion to two Fire Bros., the trio must find out which Fire Bro has the Medallion by fighting them and receiving hints from them upon defeat. Fire Bros. attack by standing on either side of one of the brothers and throwing fireballs at him. This must be dodged by jumping over them, causing the Fire Bro on the other side to take damage from the fireball. They also occasionally throw Mushrooms over the brother. Fire Bros. can also attack by throwing fireballs into the air, occasionally jumping when throwing them. After the trio's next turn, the fireballs come back down, with the fireballs that were thrown while the Fire Bro was jumping missing. Fire Bros. appear in Mario & Luigi: Superstar Saga + Bowser's Minions, where they are enemies and recruitable allies found in Minion Quest: The Search for Bowser. They are ranged troopers, and attack by throwing fireballs at enemies. Fire Bros. are strong against Pokeys and Fuzzbushes, though they are weak against Ice Bros.
Fire Bros reappear in Mario & Luigi: Bowser's Inside Story + Bowser Jr.'s Journey, where they are found as enemies and recruitable allies in the Bowser Jr.'s Journey mode. They are strong against plants, such as Fire Stalking Piranha Plants, Sockops, Borps, Treevils, and Beehosses. However, they are weak against Ice Bros. and Parabones. In Mario Golf: World Tour, one of the names that can appear on the tournament scoreboard is "Fire Bro". Fire Bros. appear in Mario Kart 8 and its enhanced Nintendo Switch port Mario Kart 8 Deluxe as spectators on Bowser's Castle and 3DS Neo Bowser City. Fire Bros. return in Captain Toad: Treasure Tracker, only appearing in Battle Tower Blitz and Beep Block Sky Plaza. Fire Bros. appear as enemies in Puzzle & Dragons: Super Mario Bros. Edition. They're Fire attribute characters, and their skill changes all Wood Orbs into Fire Orbs, while their Awoken Skill increases the amount of HP that gets restored whenever Heart Orbs are cleared. When fought as enemies, a Fire Bro always delivers a first strike attack on the player, and it can also deliver frenzied blow attacks which deal more damage than normal to the player. A player can get a Fire Bro by using five Fire Flowers to transform a Hammer Bro. In Mario Tennis Aces, Fire Bros. are found in the adventure mode level Sure Shot Challenge (Advanced), where two of them throw tennis balls along with a Hammer Bro. They are also found in the level at Castle Gates, Defeat Bowser's Minions!, where they are the second group of enemies that must be fought. They attack by throwing fireballs, and can be defeated by knocking the fireballs back at them. Some fireballs are purple, and they must be blocked to kncock them back at the Fire Bro, causing it to bounce back as a regular fireball. Fire Bros replace Vindicators in Minecraft's Super Mario Mash-Up Pack. Fire Bros are virtually identical to Hammer Bros in appearance, featuring the same colored skin, belly plate, nose, and eyes, though with differences such as wearing red helmets, shoes, and shells. Compared to Hammer Bros, Fire Bros have maintained a consistent design, though there are a few exceptions. In their debut appearance, Super Mario Bros. 3, Fire Bros have red skin and black helmets, shells, and shoes, though this is likely due to the NES' technical limitations. The DIC cartoon The Adventures Of Super Mario Bros. 3 recreates Fire Bro's appearance in the game; thus, it has a red tint to its skin, though not to the same degree. In Paper Mario: The Thousand-Year Door and Super Paper Mario, Fire Bros use an altered design, featuring rounder body proportions, slightly shorter arms, and spiked armbands. From Paper Mario: Sticker Star onwards, Fire Bros use their design from Mario Superstar Baseball and onward, but with a paper outline. When throwing Cappy at Fire Bros in the Luncheon Kingdom in Super Mario Odyssey, it is revealed that they have three spiky tufts of fiery, orange hair. A Fire Bros' most common ability, is of course, the ability to shoot fireballs from its hands. In Super Mario Bros. 3 and The Adventures Of Super Mario Bros. 3, Fire Bros spit fireballs out of their mouths instead. In the latter form of media, specifically in the episode "The Venice Menace", Fire Bros can breathe streams of fire. The early Paper Mario games revisit their ability to spit fireballs. Some games add variations to the Fire Bros' main attack. In Mario & Luigi: Dream Team, Fire Bros will either rapidly hurdle fireballs, or they'll shoot a large fireball into the sky, which rains down as smaller fireballs. In Mario & Luigi: Paper Jam, Hammer Bros will leap high into the air to shoot a fireball that plummets at their adversaries. In Mario Tennis Aces, Fire Bros can shoot stronger purple fireballs at Mario. In Puzzles and Dragons: Super Mario Bros. Edition, a Fire Bros' main attribute is Fire, meaning that it can change all Wood Orbs into Fire Orbs. Aside from limited pyrokinesis, Fire Bros retain their original species' agility, due to jumping very high. Fire Bro also hops even when idling. In the Mario Baseball series, Fire Bro has slightly less speed and the worst pitching skills out of his counterparts, but he makes up for these shortcomings with great fielding abilities and the best batting abilities among his counterparts, thus making him a character leaning more towards power. Like all Hammer Bro variants, Fire Bros did not have voice acting or text dialogue in most early Mario games, both due to technical limitations and Nintendo's habit of having silent characters. There are a few exceptions to this, such as Mario Party 9, which gives Fire Bro in-game text dialogue so the player can understand what he is saying. Most contemporary Mario games have Fire Bro voiced by Motoki Takagi (who also voices Hammer Bro and Boomerang Bro), though his speech is limited to grunts, yells and even a few lines such as "Let's go." Card Description This elite Koopa has an unhealthy fireball fixation. However, it's a big hit at Koopa cookouts. Quotes Usual: "Burn!" ~ "Here comes the heat!" ~ "FWOOSH!" ~ "I'm gonna light you up!" Redpepper Volcano: "Sound off!" ~ "Last one!" ~ "Coach, is this a drill?" ~ "We've been practicing hard!" Minion Quest: The Search for Bowser bio: They throw fireballs as well as a Mario Bro! Burning Fuzzbushes and Pokeys is a cinch, but they're weak to Ice Bros.
Bowser Jr.'s Journey bio: Strong against plantlike enemies like Treevil, but weak against the ice that Ice Bros. throw. For this subject's image gallery, see Gallery:Fire Bro. This page was last edited on April 21, 2019, at 09:39.